Sambal is one of the foundation stones of Indonesian cuisine. It is often referred to in translation as chilli relish—but it is so much more than just a condiment, such as mustard or tomato ketchup. It might be served as a side dish, to accompany a main dish. But it is also often made into a main dish in its own right. I’m going to show you how to make a basic sambal, sambal terasi, and then turn this into a dish that is more of a main dish—sambal terong. ‘Terong’ means ‘aubergine’ in Indonesian. Sambal terasi, as its name implies, is essentially chillies and terasi, or shrimp paste, which I wrote all about in my last blog. I think of this as being the basic sambal. My family in Jakarta call it sambal ulek. But I know that some cooks use this name for an even more basic sambal, which doesn’t even have terasi—it’s just chillies ground with salt. 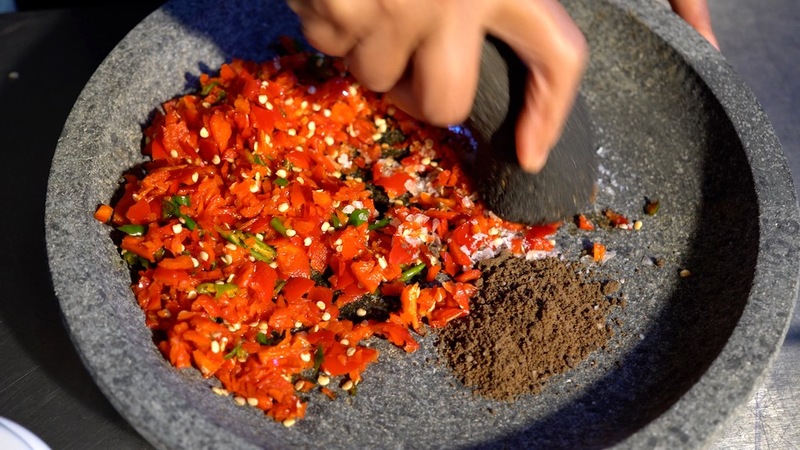 The traditional way of making sambal, as well as grinding the herbs, seeds, nuts and spices in many Indonesian dishes, is with a shallow stone mortar and a stone pestle. 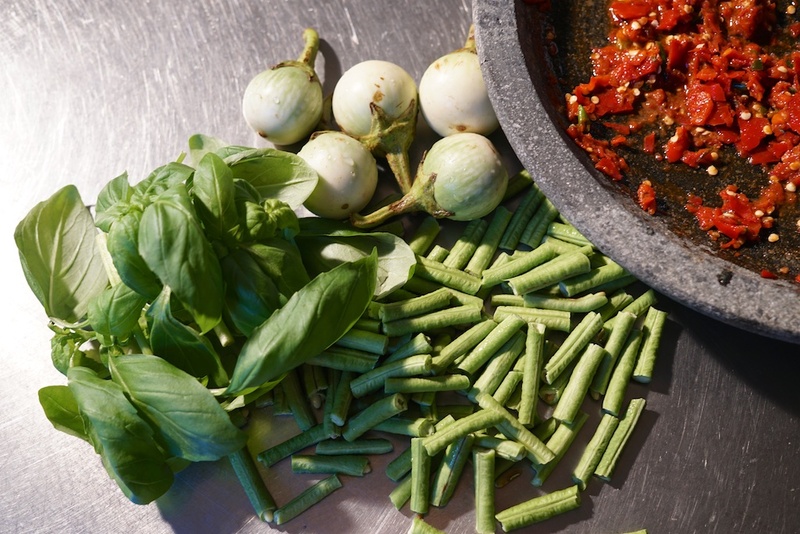 The pestle is called an ulek-ulek, from the Javanese for ‘to grind’ — hence the name sambal ulek. 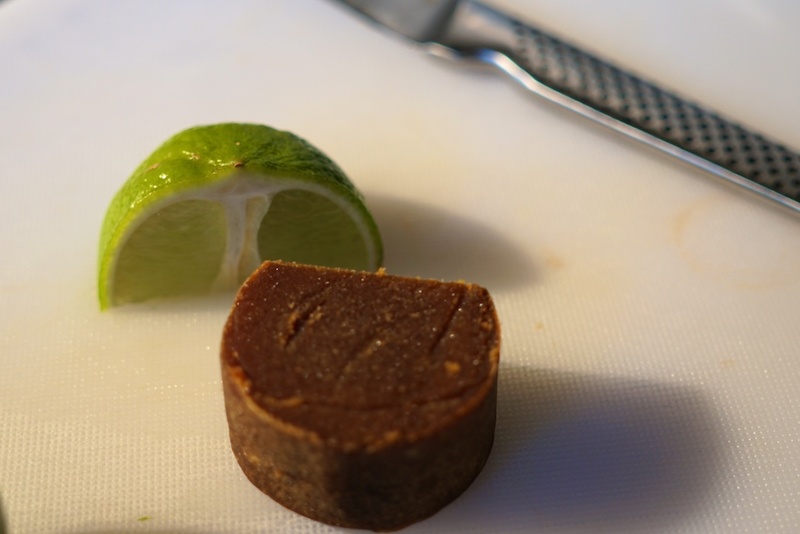 You can use a food processor and still get perfectly good results, but I reckon the effort of using a pestle and mortar really connects you with the raw ingredients, and somehow the end result tastes that little bit better! Unfortunately it’s not easy to find these shallow stone pestle and mortars in the UK, where I live. I use two, both of them brought from Indonesia. I think you can find them in some Chinese supermarkets—if I find a supply I’ll post it on my blog. If you are in the US there is an online operation called Indo Food Store that sell them, together with most the ingredients you’re ever likely to want. Click to go to their website page. I have seen recipes for sambal that call for the chillies to be boiled first. Personally I don’t do this. I prefer to use them raw. This retains their fresh, vibrant flavour. I also keep the seeds, which some discard in the interests of reducing the heat level. Sambal terong is really just sambal terasi with a couple of extra ingredients. It is still essentially a dish of raw ingredients, with the exception of the shrimp paste, which has been cooked in advance. This recipe is in fact my mother’s. The common way to serve sambal in Indonesia is to put the basic sambal ulek, or sambal terasi, in its own dish on the dining table, together with plates of different vegetables (or even fruits). You take a selection of vegetables, some lightly boiled, some raw, put them on your plate, and eat them together with a liberal quantity of sambal. Simple, but oh so delicious! Well my mum decided one day to serve a couple of the raw vegetables, the aubergines and the long beans, together with the chilli relish ground together on the same dish. The Soekardjo version of sambal terong was born! Quantities shown are for enough sambal terong for four, served as a side dish, served with a main dish of meat or fish. If we have it at home on its own, just with rice, we would eat this amount between the two of us. Green chillies | 9 or 10 (the small, hot ones; usually called finger chillies—though they’re smaller than anyone’s fingers— or the smaller, hotter bird’s eye); quantity depends on how hot they are, and how hot you want the sambal! You can even leave them out completely. Red and green chillies Cut the stalks off and break them into a food chopper or processor. The green chillies are small enough to be popped in whole. Blitz for a few seconds to break the chillies down to a coarse pulp. 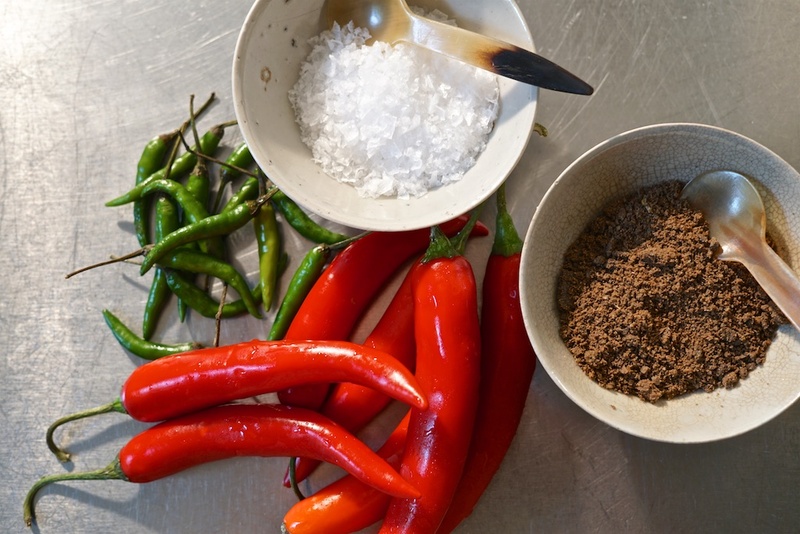 Scrape out the chilli pulp onto a mortar. Sea salt, terasi Spoon the salt and the terasi onto the mortar, then combine them with the chillies using the pestle, until you get a uniform mixture. This process should take a minute or so. You want the to break the chillies down a bit more, but you’re not looking for a smooth paste. Lime, palm sugar Squeeze lime juice over the mixture, add the palm sugar, then grind for another 30 seconds or so, to incorporate everything nicely together. At this stage you have your basic sambal terasi. You can serve this as a relish to accompany many other dishes, or as an ingredient in recipes that call for red chillies. It will last in a jar with a lid for a couple of weeks in the fridge. White aubergines, Chinese long beans If you are going to carry on and make sambal terong, roughly chop the aubergines and cut the beans into 2 cm long pieces, and add to the mortar. Lightly smash the vegetables into the chilli mixture. You’re looking to break up the surface of the pieces, rather than reduce them in size. Basil Pick the leaves off the basil stalks and scatter over the mixture. Then just bruise the leaves with the pestle. With a table spoon just give the mixture one final stir, making sure all the ingredients are evenly distributed. If you don’t have a pestle and mortar there’s really no reason you can’t get perfectly good results doing all these steps using a food processor. Just be sure not to reduce everything to a uniform pulp. It needs to be chunky! Be particularly careful when adding the aubergines and beans—just a very quick burst so as not to chop the vegetables too small. And break the basil leaves up by hand and add them to the sambal after you’ve removed it from the processor. Or for something more substantial you can serve it as as a side dish with a main dish of meat or fish. Red and green chillies. I wrote a blog about chillies a while back. It is very difficult to specify the type, since retailers are usually pretty vague about the variety on offer: if you look for ‘red chillies’ on the Tesco website you’ll see that the little packs they sell are the produce of ‘UK, Jersey, Egypt, India, Kenya, Morocco, Mozambique, the Netherlands, Senegal, Spain, Zimbabwe’—so I guess it’s hardly surprising! The inescapable fact, as I wrote in the blog, is that you just don’t know from one batch of chillies to the next how hot they are going to be—even if you use the same type. Welcome to the world of natural cooking, where things do vary from one session to the next! Just bear in mind the rule: the smaller the hotter. Shrimp paste (terasi). Covered in depth in my last blog. Sea salt. For my catering I buy Malvern salt flakes in a big plastic tub. I prefer flakes to crystals, since they are easier to incorporate into dishes that are not cooked. Lime. My secret weapon. I use lime juice in nearly everything I cook. It seems to add an extra flavour dimension to food, whether savoury or sweet. And it’s good for you—no sugar, no fat, no salt, and packed with vitamin C! The more lime juice you use, the less salt you need. Palm sugar. The sugar made from a number of members of the palm family, including the Palmyra palm, the sugar palm, and the coconut palm. The abundant sap from these trees is boiled down into a thick syrup, or further into crystallized blocks. Most the big supermarkets now sell it in a granulated form in jars. Unlike the cane and beet sugars we use as a rule in the west, palm sugar has a distinct and delicious nutty, winey flavour. White aubergines. These are delicious eaten raw. They are hard and crunchy, not at all like the standard purple aubergines which we are more familiar with. They were though probably the first variety known in the west, and make sense of the American name for aubergine: egg plant. For where to buy them, see below “Where to find ingredients”. On Amazon they’re called “fresh Thai round eggplant”. Since this recipe calls for them to remain uncooked I wouldn’t recommend substituting the softer common aubergine. Chinese long beans; also called yard-long beans, and asparagus beans. They look like big French beans—but they’re not. They are crunchier, with a similar flavour, but stronger. They are in fact more closely related to the mung bean and black-eyed pea. See “Where to find ingredients”—the Asian supermarkets usually have them, and at the time of writing so does Thai Food Online. It has become so much easier to find Asian ingredients in the UK since I started cooking in this country over 30 years ago. Back then I was always giving my husband long shopping lists for him to get me in London’s Chinatown. He’d struggle home on the train with as many overflowing carrier bags as he could carry, smelling like—well, an Asian supermarket! Now most small towns have a shop selling at least some fresh Asian ingredients, and the big supermarket chains stock an ever-growing selection. You can also buy most things on Amazon. Just bear in mind that the supermarkets and Amazon do tend to use ‘Thai’ as the generic description for any ingredients from South-East Asia, including Indonesia. There is also a website called Thai Food Online that sells most things. Personally I get the majority of my Asian supplies from Sun Hung Chang a wonderful supermarket that has been going for 20 years at the top end of Commercial Road in Portsmouth. There’s are some photos in my last blog. Everything for this sambal recipe can be bought there. For those living near my home town of Haslemere, Surrey there is a newer, smaller, but closer place in Bordon. They don’t have anything like the range of Sun Hung Chang though.